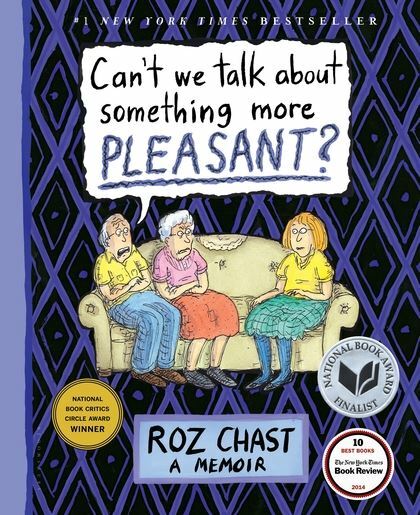 June Book Club: CAN’T WE TALK ABOUT SOMETHING MORE PLEASANT? In honor of Father’s Day this weekend, I’ve selected Can’t We Talk About Something More Pleasant? by Roz Chast for June’s Book Club. It’s a memoir about aging parents, which seems like a beautiful way to honor my dad! HI DAD! HAPPY FATHER’S DAY! CAN YOU BELIEVE YOU’VE BEEN A DAD FOR ALMOST THIRTY YEARS?! IT DOESN’T GET EASIER, DOES IT?! I also picked this book because it’s been on my list for months, and people keep telling me how incredible it is. I love anything that makes me cry from laughing and cry from feeling all the feelings, and this National Book Award Finalist apparently achieves both in spades. Chast is a famous cartoonist, and it’s told through cartoons, family photos and documents. She’s an only child, and covers what it’s like when the parent-child roles reverse. I know how she feels, because my mom refuses to speak to the hostess when we go to restaurants because she’s “shy,” and my dad takes their dog-children to In-N-Out once a week, which is surely a sign of dementia.